Miochin, Natsuko, and Shinako are three colorfully dressed Harajuku girls who we met this time on the street in Tokyo’s Shibuya neighborhood. 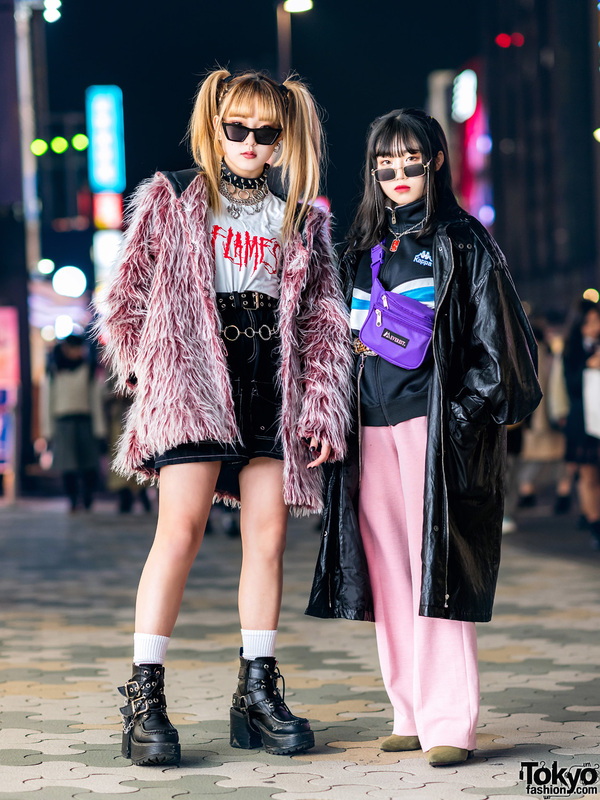 Miochin – a 20 year old YouTuber on the left – is wearing a colorful graphic dress from the resale shop Kinji Harajuku with resale cuffed denim and sneakers she also purchased in Harajuku. She’s also wearing costume jewelry, a belt from Claire’s, a hairband, and an Adidas shoulder bag. Her favorite designer is Anna Sui and her favorite shop is Kinji Harajuku (vintage). She likes the music of Maroon5 and Ban Box. Follow her on Instagram and Twitter for more colorful vintage fashion. Natsuko – a 20 year old college student with blue hair – is wearing a Faline Tokyo t-shirt with pink wide pants by the Japanese streetwear brand Little Sunny Bite and Vans checkered slip-on sneakers. Accessories include sunglasses, a Stussy Women belt, and a Moschino Powerpuff Girls purse. Her favorite fashion brand is Little Sunny Bite and she likes Disney music. She is active on both Instagram and Twitter. 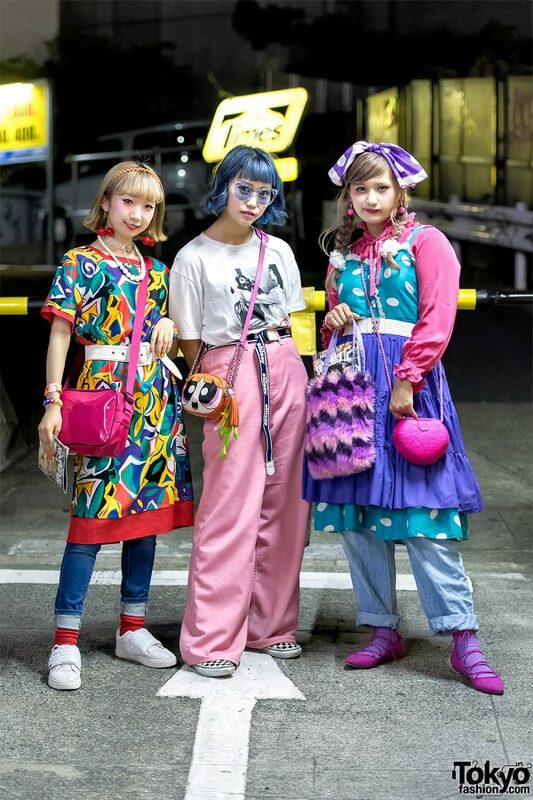 Shinako – a 21 year old college student – is wearing colorful vintage tops and bottoms from the Harajuku resale shop Panama Boy with purple Forever21 flats. Her colorful accessories – some of which came from the resale shop Fizz – include a polka dot hair bow, a belt, and several bags including a plush one from Anierbox. Her favorite designer is the Japanese remake specialist Cathy Southpaw and she likes the music of Kyary Pamyu Pamyu. Follow her on Instagram and Twitter too.